Pictured: Manny Malhotra, ultimate team player, enabling Ryan Kesler to complete a fist-bump. 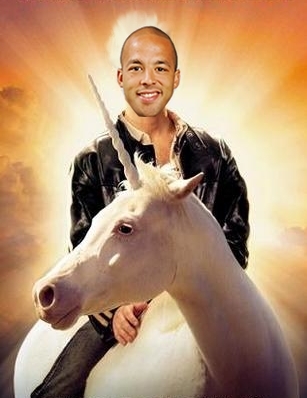 It wasn't that long ago that Manny Malhotra was receiving premature buzz for the Selke Award. Now, mired in a 16-game pointless drought, questions are being raised about his role as the third-line center, with some suggesting that Hodgson might supplant him before the season is done. I heard from some quarters that Hodgson's line with Tanner Glass and Jeff Tambellini may as well have been the third-line against the Coyotes, as they often seemed more effective on the ice than the trio of Malhotra, Torres, and Hansen. And tonight on the Team 1040, one of the topics of conversation was whether Malhotra is actually worth his pricey 2.5 million dollar contract. Yes. The answer is yes, he is. Don't get me wrong. His point-scoring drought is regrettable and it would be nice if he and Torres broke out of their slumps to provide some tertiary scoring, but Malhotra's value isn't found in directly providing scoring. Instead, Malhotra is an enabler. He enables the scoring in others, particularly in Ryan Kesler and the Sedins. Unlike a playmaker, who enables scoring in linemates, Malhotra enables the scoring of those on other lines. The addition of Malhotra has had a trickle up effect, as he takes on the checking role previously held by Kesler, freeing Kesler up to greater offensive opportunities, which he has capitalized on with aplomb. Meanwhile, despite Kesler's increased offensivity, Henrik Sedin and his line have been able to continue in their primarily offensive role thanks to Malhotra's presence in the lineup. I'm going to take a look at how this plays out using two different statistics from Behind The Net: Corsi Relative Quality of Competition (Corsi Rel QoC) and Offensive Zone Start Percentage (Ozone%) and how Malhotra compares to the two centres above him, Kesler and Sedin. I will then be following it up with a brief discussion of faceoffs. I will be limiting each to players who have played at least 20 games. As I pointed out in a footnote in a recent post, Manny Malhotra has the lowest Ozone% on the Canucks. He starts in the offensive zone a miniscule 27.7% of the time. He is trusted to take the vast majority of the Canucks' defensive zone faceoffs, and for good reason: he's currently second in the NHL in faceoff percentage, right behind Washington's David Steckel, who has taken 370 fewer faceoffs. In fact, Malhotra has won the most faceoffs in the NHL, with 591 victories. NHL.com doesn't distinguish between defensive and offensive zone faceoffs, which is unfortunate, but from observation I can tell you that the majority of those wins were in the defensive zone. To illustrate the significance of this, note that Malhotra has the second lowest Ozone% in the entire NHL. Malhotra is on pace to take 1495 faceoffs this season. Of those, 1081 will be in the defensive zone. That averages out to around 13 defensive zone faceoffs per game, compared to 5 offensive zone faceoffs. What's especially interesting is that this is a massive drop in offensive zone starts for Malhotra. In San Jose last season, he started in the offensive zone 45.3% of the time. In Columbus the year before, it was 43.4%. The biggest impact of this stat has been on Henrik Sedin. In 2008-09, Sedin started in the offensive zone 49.9% of the time. This saw a modest bump to 57.7% in 2009-10. This season, with the addition of Malhotra, Sedin is starting in the offensive zone a whopping 70.1%, good for third in the NHL behind Cam Janssen and--surprise!--Daniel Sedin. In the article on Alex Edler, I referred to this kind of discrepancy in zone starts as sheltering Edler, but it might be more accurate to refer to it as putting your best offensive players in the best position to score. Kesler has also seen a modest bump in Ozone%, but it's about as modest as Bristol Palin's outfits and, like Bristol Palin, not really worth mentioning. When it comes to Corsi Rel QoC, however, the addition of Malhotra has made a massive difference for Kesler. First, a quick definition of terms: Corsi is a measurement of total shots attempted both for and against. Essentially, add up all the goals, shots, blocked shots, and missed shots that your team has taken while you are on the ice and subtract all the goals, shots, blocked shots, and missed shots that the opposition has taken while you are on the ice. It's a measure of puck possession that strongly correlates to scoring chances and, therefore, goals. Relative Corsi is a method of normalizing a Corsi rating by comparing a player's Corsi rating with the team's Corsi rating when he is off the ice. It's considered to more accurately measures an individual players contribution to puck possession. Finally, Corsi Rel QoC is a measurement of the quality of competition a player faces based on the Relative Corsi of his opponents. It's more accurate than the base Quality of Competition stat, which uses +/-. Does that make sense? Good. Moving on. In 2008-09, Kesler led the team in Corsi Rel QoC, with a rating of 1.265, just ahead of Willie Mitchell. This was good for 13th in the NHL; night in and night out, Kesler faced the best players the opposition had to offer and earned his first Selke nomination. Last season, Kesler was second on the Canucks, just behind Willie Mitchell. Kesler continued to face tough competition, increased his offensive production, and was once again nominated for the Selke. This year, however, Malhotra is taking the heat off Kesler, as Malhotra is third in Corsi Rel QoC on the Canucks, first among forwards. Meanwhile, Kesler is facing the 8th toughest competition, freeing him from his checking duties. The result: Kesler has embraced the offensive side of his game: he has already bested his career high in goals, is on pace for 47 goals and 32 assists, and is receiving hype not for the Selke, but the Hart. With Malhotra bearing the brunt of the opposition's offensive pressure, Kesler has gone from first amongst Canucks forwards in Corsi Rel QoC to sixth. Intriguingly, the total number of faceoffs taken has been fairly evenly split between Malhotra, Kesler, and Sedin. The three centres are on pace for 1495, 1471, and 1437 faceoffs respectively. The total difference from top to bottom is less than one faceoff per game. Last season, Henrik took 1527 faceoffs to Kesler's 1401. Next closest was Kyle Wellwood with 725. The difference was more pronounced in 2008-09 as Henrik took 1364 faceoffs to Kesler's 976, with Wellwood lagging behind at 621. To be fair, Kesler played on Mats Sundin's wing for the latter part of that year. Oddly enough, despite being one of the best faceoff men in the league last season at 62.5%, Malhotra took only 664 draws for the Sharks. It could be argued that the Sharks underutilized him, though to be fair, Scott Nichol is not too shabby at faceoffs. In any case, the number of faceoffs that Malhotra takes for the Canucks dwarfs Kyle Wellwood's contributions the last couple of seasons. As good as Wellwood was on the draws, Malhotra is even better and is clearly more trusted by the coaching staff. This balance in faceoffs taken spreads the responsibility around, with Malhotra taking the majority of defensive zone faceoffs, Henrik taking the majority of offensive zone faceoffs, and Kesler splitting between the two fairly evenly. And with Malhotra taking over the role of checking line center, facing the toughest competition the other team has to offer, Kesler has been free to focus on his goalscoring. It's also noteworthy that even with his 16-game drought, Malhotra is still on pace for 27 points this year, right on par with his post-lockout career totals. He has been carrying the puck to the net with some authority recently and has come achingly close on numerous scoring chances to end his slump. But the Canucks are not dependent on him doing so: he just needs to continue lightening the load of his teammates on the top-two lines, enabling them to continue their potentially award-winning seasons. Agree wholeheartedly. To oversimplify, the fans ragging on Malhotra need to avoid placing sole emphasis on the scoring sheet in judging players' worth. I'm really enjoying the statistical delving and analysis you're doing these days Skeeter! Thanks for doing the grunt work on bringing some mighty fine points to light. Could we please make that reading mandatory for the MSM complaining about Manny! Nice analysis, but I'm amazed it's necessary. Watching Manny go in a game makes him worth any price as far as I'm concerned, and I wish he was still a Shark. This is great. I'm psyched to see a Canucks blog that is so well-written and also using some of the best tools of the hockey blogosphere. I have an extra theory on Kesler's "enabling" the Canucks to get Malhotra (and others). Remember when Mike Gillis took over he had a hard time getting free agents to sign, and thus went after old clients (Pavol Dmitri) and then also Mats Sundin, where Sundin was his first coup (he's said as much himself in a recent interview). 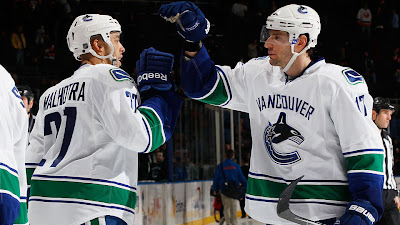 The addition of Sundin broke the Kesler-Burrows shut down pairing, and Kesler's role expanded. The Sedins' scoring took off as a result, and Burrows was put on their wing. Two summers ago, Gillis went after Malhotra, but couldn't get his man, who wanted to play on a real contender, and thus played for less. At the same time, MG managed to re-up the Sedins and Luongo. Last year, Kesler's improvement in playing against the toughest competition meant that Henrik Sedin scored in piles (aided by good percentages) which got him to the Hart. Kesler also re-upped. Now the Canucks looked like contenders, and they manage to get Hamhuis, Malhotra, Torres, all for relatively cheap (better offers elsewhere), as well as the Sweatts, Tanev, etc. I'm not saying that this is all due to the image of the team as being a real contender, but it seems to have helped. That's all to say that last year's Kesler enabling Hank to shine, helped the Canucks find another enabler, Malhotra, which is enabling Kesler to play more offensively. Solid post, Manny is worth every penny and his PK is Poetry in Motion. Will the sky fall tonight or will a Chicken hawk continue to chirp? Behind The Net unfortunately doesn't calculate individual faceoff wins and losses, but take a look at who's on the ice for the most defensive zone wins in the entire NHL. Great work, as usual, guys. Nice find Cam! That's excellent. @kenny - win or lose, Chickenhawk will continue to chirp. It's pretty much a guarantee. Nice read as always Skeeter. Completely agree! One more thing to note, as far as his "enabling" Kesler - Manny's arrival has also affected Kesler's special teams time. Two years ago Kes was averaging 3:19/gm short handed, which was the most out of all our forwards, and played only 2:23/gm on the powerplay. Last year there were a couple forwards (Johnson and Pettinger), who averaged a little more PK time per game, but Kes still had the most minutes overall (218:20 vs 165:00 and 24:20) and took 241 faceoffs compared to Johnson's 187. His PP time started to go up (2:45/gm), but he was still fourth out of the team's forwards, and his main role was clearly the PK. This year those numbers have flipped; he's at 2:22/gm SH and 3:45/gm PP (team high!). While there are many factors behind the increased power play time, the fact that Malhotra is becoming the PK leader is certainly one of them. MM is now tops on the team in shorthanded time at 2:47/gm, and has taken the majority of faceoffs - 181 (winning 60.7%) to RK's 142(46.5%) - taking that responsibility off Kes and allowing him to focus more on the pp. Looking at the numbers over the past three seasons, I suspect Gillis and AV were trying to shift Kesler's role to a more offensive one last year. When Johnson was healthy, he had the highest PK minutes out of the forwards and took the most faceoffs. However, he was too often injured (and not quite talented enough) to fill that role effectively, meaning the Canucks still had to depend heavily on Kesler. Manny, on the other hand, is filling that time very capably. Excellent work, M. I was tempted to get into the special teams argument, but the post was already quite long, so I decided to stick with even-strength stats. I like that you delved into shorthanded faceoffs: interesting stuff. I actually pared that down a little too; it's really easy to get carried away. I could have written a few more paragraphs on the topic of faceoffs alone. Malhotra?! What about Kyle Turris?? Where is the fairness!?! Last night, I made this same argument, albeit nowhere near as eloquent, nor statistically specific as you have here. The thread was about the chemistry of the Kesler line and the topic veered off a little(as CDC threads always do) with some schlub who had to start ranting about the 3rd line's productivity like he was going to suggest we trade them. It took me a couple back and forth's with the guy before he quitely decided he lost. I just wish you had written this yesterday to have saved myself the trouble. I always appreciate you guys here and your well calculated opinions. I feel like I can never disagree with you... and you make me laugh... You'd be the perfect polygamist spouses for me! Did Victor Oreskovich Need to be Deprogrammed? This is Not "Our Year"
What Do You Want, Canucks Fans?